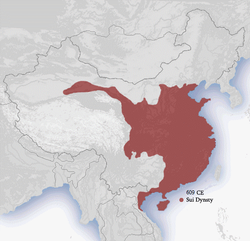 The Sui dynasty (Cheenese: 隋朝; pinyin: Suí Cháo) wis a short-lived imperial dynasty o Cheenae. The Sui unifee'd the Northren an Soothren dynasties an reinstalled the rule o ethnic Cheenese in the entirety o Cheenae proper, alang wi sinicisation o umwhile nomadic ethnic minorities (the Five Barbarians) within its territory. It wis succeedit bi the Tang dynasty, that lairgely inheritit its foondation. Foondit bi Emperor Wen o Sui, the Sui dynasty caipital wis Chang'an (which wis renamed Daxing, 581–605) an later Luoyang (605–618). Emperors Wen an Yang unnerteuk various centralised reforms, maist notably the equal-field seestem, intendit tae reduce economic inequality an impruive agricultural productivity; the institution o the Three Depairtments an Sax Meenistries seestem; an the staundartisation an re-unification o the coinage. Thay an aw spreid an encouraged Buddhism ootthrou the empire. Bi the middle o the dynasty, the newly unifee'd empire entered a gowden age o prosperity wi vast agricultural surplus that supportit fest population growthe. A lastin legacy o the Sui dynasty was the Grand Canaul. Wi the eastren caipital Luoyang at the centre o the netwark, it airtit the wast-lyin caipital Chang'an tae the economic an agricultural centres o the east taewart Hangzhou, an tae the northren mairch near modren Beijing. While the pressin ineetial motives war for shipment o grains tae the caipital, an for transportin truips an militar logeestics, the reliable inland shipment airts wad facilitate domestic treds, flowe o fowk and cultural exchange for centuries. Alang wi the extension o the Great Wall, an the construction o the eastren caipital ceety o Luoyang, thir mega projects, led bi an efficient centralised bureaucracy, wad amass millions o conscriptit wirkers frae the lairge population base, at hivy cost o human lifes. Efter a series o costly an disastrous militar campaigns against Goguryeo, ane o the Three Kinricks o Korea, endit in defeat bi 614, the dynasty disintegratit unner a series o popular revolts culminatin in the assassination o Emperor Yang bi his meenisters in 618. The dynasty, that lastit anerly thirty-seiven years, wis unnermined bi ambeetious wars an construction projects, that owerstretched its resoorces. Pairteecularly, unner Emperor Yang, hivy taxation an compulsory labour duties wad eventually induce widespreid revolts an brief ceevil war follaein the faw o the dynasty. The dynasty is eften compared tae the earlier Qin dynasty for unifeein Cheenae efter prolanged diveesion. Wide-rangin reforms an construction projects war unnertaken tae consolidate the newly unifee'd state, wi lang-lasting influences ayont thair short dynastic rings. ↑ In 617, the rebel general Li Yuan (the later Emperor Gaozu o Tang) declared Emperor Yang's grandson Yang You emperor (as Emperor Gong) an "honored" Emperor Yang as Taishang Huang (retired emperor) at the wastren caipital Daxing (Chang'an), but anly the commanderies unner Li's control recognised th chynge; for the ither commanderies unner Sui control, Emperor Yang wis still regardit as emperor, nae as retired emperor. Efter news o Emperor Yang's daith in 618 reached Daxing an the eastren caipital Luoyang, Li Yuan deposed Emperor Gong an teuk the throne himsel, establishin the Tang dynasty, but the Sui offeecials at Luoyang declared Emperor Gong's brither Yang Tong (later an aa kent as Emperor Gong during the brief reign o Wang Shichong ower the region as the emperor o a brief Zheng (鄭) state) emperor. Meanwhile, Yuwen Huaji, the general unner whose leadership the plot tae kill Emperor Yang wis carried oot, declared Emperor Wen's grandson Yang Hao emperor but killed Yang Hao later in 618 an declared himsel emperor o a brief Xu (許) state. As Yang Hao wis completely unner Yuwen's control an anly "reigned" briefly, he is nae uisually regairdit as a legitimate emperor o Sui, while Yang Tong's legitimacy is mair recognised bi historians but still disputit. ↑ CIHoCn, p.114 : « dug atween 605 an 609 bi means o enormous levies o conscriptit labour ». ↑ "Koguryo". Encyclopædia Britannica. Retrieved October 15, 2013. ↑ Byeon, Tae-seop (1999) 韓國史通論 (Outline of Korean history), 4th ed, Unknown Publisher, ISBN 89-445-9101-6. ↑ "Complex of Koguryo Tombs". UNESCO World Heritage Centre. Retrieved 2013-10-24. This page wis last eeditit on 2 Apryle 2019, at 19:19.